We are a Yoga Alliance certified school, and the curriculum is prepared to be a well rounded experience. You will be offered tools to best prepare you to offer yoga experiences that are empowered, intelligent, creative and safe. We foster a learning environment that is experiential, deeply rooted in community and personal accountability. Whether your interest is to teach as a career or deepen your personal awareness of your yoga practice, we will meet you where you are and encourage your growth all along the way. This training includes a 3 day Yoga Retreat to Mexico, where you will teach your very first class as a yoga instructor, over looking the ocean! Best way to celebrate all your hard work! Bree and Maggie have a combined experience of over 20 years in the yoga and fitness industry. Each teacher has an authentic and unique style with a strong foundation in the philosophy of yoga, fostering community and building strong relationships with students that harness each individual students skill sets, interests and areas for growth and elevation. At the very depth of their hearts lies a strong passion for sharing yoga and encouraging others to find purpose and joy in life. The iHeartYoga sequence is well rounded, intelligent , safe and creative. It provides a strong foundation for teachers to develop the skills required to create inspired, artfully crafted personalized yoga sequences. Through the lens of the iHeartYoga sequence as a blue print teachers will understand the importance of seamless transitions, layering foundational postures that lead to body awareness and preparation for more advanced layers of posture. The sequence emphasizes a balance of strength and flexibility with freedom and structure. Together we explore crafting classes that deliver anatomically focused themes with variations and offerings for students of all levels of practice. You will be given the tools to navigate through injury prevention and recovery. Learn to incorporate props such as blankets, bolsters, blocks, and straps for both the progression and regression of postures to support students in a fully integrated and successful understanding of their bodies and postures. Touch and connection are basic human needs, they are healing, empowering and transformational when delivered with intention and clarity. You will learn how to assist your students from a place of purpose through alignment and appropriate depth. Intentional touch encourages and empowers the student to understand the “WHY and HOW” of the posture. We teach key concepts such as energy lines and sensation based anatomy language. You will observe bodies and make decisions based on what you see in the present moment with each body. We will explore assists that are universally known and also learn how to assist from a more personalized and informed perspective that is unique to each individual student. The opportunity to practice teach and refine your skills is not often focused on in every training. We believe that you need time to foster your skills and confidence in teaching your sequences and providing hands on assists. You will have plenty of opportunity to receive feedback from both your teachers and fellow trainees. We deliver feedback from a place of love, encouragement and a deep belief in your potential. We want you to leave knowing you won’t have all the answers and it is always safe to ask for clarity....this is how we grow!!! We will explore the foundation of yoga known as the 8 Limb Path, this is the blueprint for living a yogic life and goes far beyond practicing physical postures. It integrates personal boundaries, moral behavior, mediation, discipline, breath work, curiosity and devotion. You will be prepared to support your students with deeply, meaningful and tangible intentions and themes that support both yogic philosophy and daily world experiences. These tools increase, mental health, fortitude, personal awareness, communication and support the well being of relationship to self and others. What you can offer your students through the iHeartYoga curriculum takes yoga off the mat and in to everyday life. YOU GET TO GO TO MEXICO WITH US!!! The iHeartYoga 200 hour teacher training includes a 3 day yoga retreat at the gorgeous Las Rocas resort in Baja. You will take your final written exam while sitting poolside in the sun. Each participant teaches the entire group an hour long class with the breathtaking ocean as your back drop. You will have time to relax and celebrate with your new yoga family! Eat delicious food, soak in the beautiful infinity pool and hot, bubbly jacuzzis. The best part...a closing ceremony where you receive your 200 hour Yoga Teacher Certificate while in Mexico!! There is no better way to complete 200 hours of hard work and dedication. Elsa started teaching yoga in the park 10 years ago, and since then has helped to cultivate the massive iHeart community we have today. 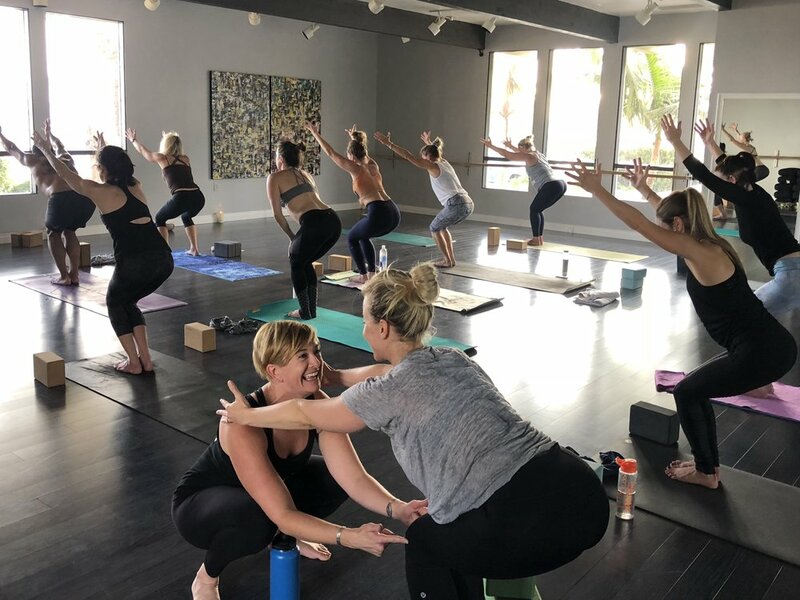 She opened the iHeartYoga studio in 2015, has led 7 teacher trainings, 35 retreats to Mexico, has organized events such as Yoga at the Mission, and Vino & Vinyasa at Doheney State Beach. She is excited to share the business of yoga with us, and ways to help launch your teaching career! Anatomy will be easy to learn, understand and apply to your daily instruction of yoga classes. Renowned anatomy teacher, Kim Fitzgerald will deliver a full body Yamuna Ball rolling workshop. You will be guided in identifying the bones, muscles and tendons that support your skeletal structure's movement through yoga posture. You will be able to incorporate anatomical cues that support and empower your students through form, function and full range of motion. You will understand how the body moves and the benefits of the posture when supported with proper personalized anatomical awareness. In this hands on workshop you will learn the FUNdamentals of Ayurveda. Thats right, Ayurveda is a LOT of FUN! Not only will we discuss the foundations of what Ayurveda is, its history, and its transformation as it was introduced to the western world, but you will also TASTE, SMELL, and EXPERIENCE elements of an Ayurveda practice first hand. You will learn to identify the three main DOSHAs (energy types) and how to balance them for yourself and for your future students. This will be an interactive workshop where your participation and willingness to ask questions will enhance the experience for all of us. The purpose of Kundalini is to awaken the energy of consciousness, to practice in a way that sheds light on our self-imposed limitations, and invites us to think out of the box and develop our intuitive mind. Through the expertise of guest instructor, Desiree Lee and a fun field trip to the Kundalini House, you will experience firsthand the powerful benefits of Kundalini. You will be given tools to support your personal practice and teaching skills with this powerful workshop and lecture. The Chakras govern your energetic body, both in subtle and obvious ways they influence your physical, mental, emotional and spiritual health. You will learn about the chakra system as it applies to you both in and out of balance. This information can directly enhance class offerings you provide to your students after graduation. Sign up by Feb 17th to save $300! Payment plan available. Call (949) 363-3152 for details. Pricing includes 3-day Baja, Mexico Retreat and unlimited practice at iHeartYoga for the duration of the training. Space is limited, reserve early to insure your spot. Still wondering if this training is right for you, or if you have any questions, please feel free to give us a call.